Here is the article (includes video) by Barry Wolf, WKYC. The odds would be one out of 365 * 365 * 365, or about one out of 48.6 million births. With 7 billion people on the planet, odds are that this has probably happened about 143 times ( to living persons. many more to those in the past). So rare, fun, and interesting, but not unbelievable. I believe it happened based on the evidence (their claim that it did, which is good enough). 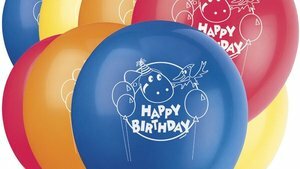 Actually since everyone has to have a birthday, we can ignore the first birthday, that of the man or the woman. So the odds someone marries someone with the same birthday (date of the year) as them is 1/365. Then the odds their baby has that same birthday would be 1/(365 * 365) or 1/133,225. So with ~7 billion people this probably happened 52,543 times to persons living on the planet now. The error in the first calculation is that the date was selected first. That calculation is correct for any specific date, whether it is January 1st or July 4th, or March 15th, or July 22nd. Anyone with better knowlege of probability please correct me if any of the above is incorrect. As often happens, things that seem unbelievable are quite believable and things that are believed without evidence are not believable. Below are the extended notes provided by cognitive psychologist and statistician Barbara Drescher for use in Skepticality Episode 246. Take a look and leave your comments below. Also, please be sure to listen to the podcast for our own hilarious commentary. Also, visit Barbara’s blog. You are correct with both calculations. It depends on how you frame it. If you’re wondering the odds of two people with the birthday of January 1st marrying and having a baby on January 1st, then the first is correct, but as you pointed out, that’s not really what’s interesting. The only thing I would add is that these calculations also assume some things that we know are not true, such as that births are uniformly distributed across the days of the year. Even if natural births were (they aren’t), we’d see fewer births on days like January 1st simply because the number of scheduled C-sections and inductions is lower because it’s a holiday. However, figuring those few things in requires data that probably isn’t available. (Submitted by Skepticality listener and friend of the blog Christopher Brown. 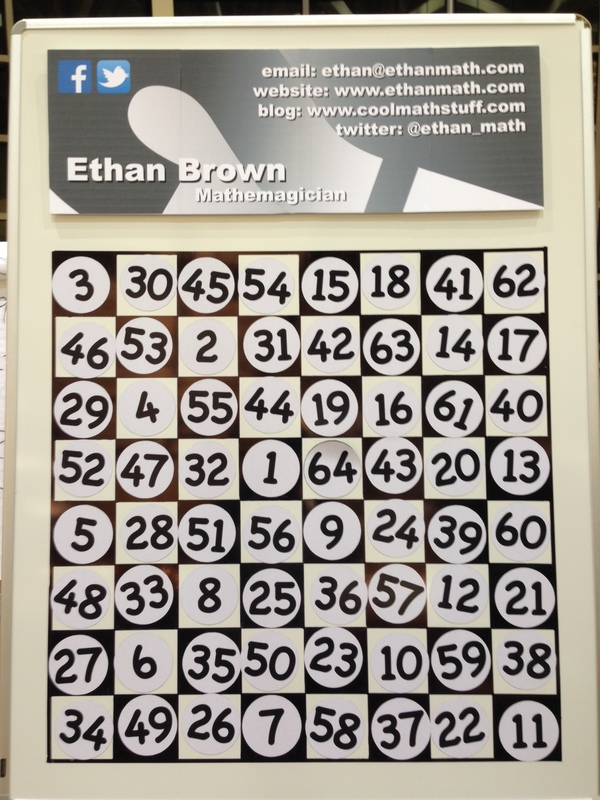 My son, Ethan Brown performs a Mental Mathematics stage show. A few months ago, he developed a new piece for his act. It’s a version of an old presentation puzzle known as The Knight’s Tour. Traditionally, performers have allowed audience volunteers to select a square on a Chessboard. The performer then begins on that square and theoretically moves a knight around the board using only legal knight moves (which are “L” shaped). The goal is to land on every single square on the board without landing on any square twice. Ethan adds an additional twist to this trick by allowing the audience to also select the final square on which the knight must land, finishing the puzzle. Since debuting this new trick, he has had a chance to perform it 5 times. 3 out of those five times, the two audience members selected the exact same two squares (only they were reversed in one of those times). Our back of the envelope calculations place the Mathematical odds at 1 in 107,374,182, though I suspect something else might be going on here. We have video of 2 of the performances if you’d like to see it. Could there be something psychological that causes people to gravitate to these squares much like people often pick “Ace of Spades” when asked to randomly think of a card? I have attached photos of the three final Knight’s Tours. Note where the numbers 1 and 64 are. Thanks! Let me know if you have any questions at all. Below are the extended notes provided by cognitive psychologist and statistician Barbara Drescher for use in Skepticality Episode 244. Take a look and leave your comments below. Also, please be sure to listen to the podcast for our own hilarious commentary. 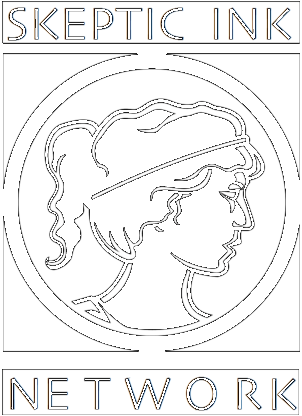 Also, visit Barbara’s blog. These notes are a bit dense for the podlet, but maybe you can use the story and just skip most of the math. First, let’s assume that the choice of square is completely random in all cases. We are not particularly interested in the odds that the audience would choose those squares because it’s not the squares themselves that are interesting. 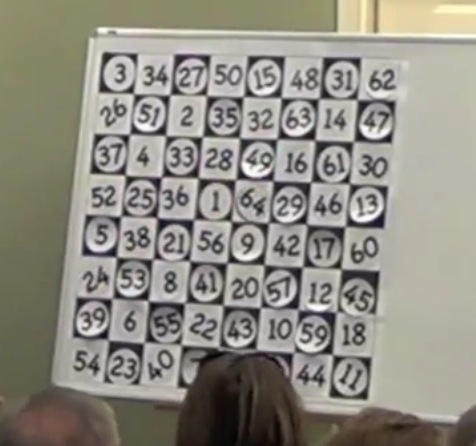 It’s the fact that the audience chose the same squares the second time Ethan performed the trick. Therefore, we are given the squares by the first audience and we want to calculate the probability that the second audience would choose those particular squares. 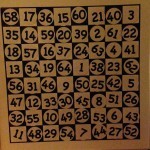 1 in 2,000 is the probability that the audience will choose the same squares on the second round that it did on the first round. The third instance is a bit different because, although the audience chose the same squares, the starting and ending squares are backwards. The calculation is partially the same, but if we allow either square to be the starting square, we are now asking a different question. We now want to know the probability of choosing that specific black square to start and white square to end, or that particular white square to start and black square to end. So, we start with the probability of each scenario, which we know to be about 1 in 2,000, then double it (it is not possible to choose both, so there is no joint probability to subtract). So, the probability of choosing either the same squares or the same squares in reverse on any subsequent game is about .00098 or about 1 in 1,000. 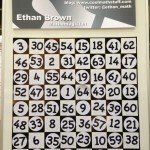 Since each time Ethan performs this trick, there is about 1 in 1,000 chance that the audience will choose those same squares as start/end points, the probability that it would happen on the 3rd, 4th, or 5th time that he performed it is about 3 in 1,000, or .003. But that is all assuming that the choices were random. I saw nothing in Ethan’s posture or delivery that would suggest any given square as a starting point. However, we do know that human beings don’t do anything at random. I doubt that anyone has conducted studies to determine which squares someone is likely to choose if they are in this particular situation, but I think it is fairly safe to say that they are at least twice as likely to choose squares in the middle of the board than on the edges. I would be interested to find out if that is true, but let’s assume that number is accurate. That changes the entire game. We could simply double the probability of choosing those same squares in the second performance, but that wouldn’t give us the whole picture. Now we have to consider the probability of choosing those squares in the first round, because it is no longer a uniform distribution. .02 x .04 = .008 or 1 in 125. 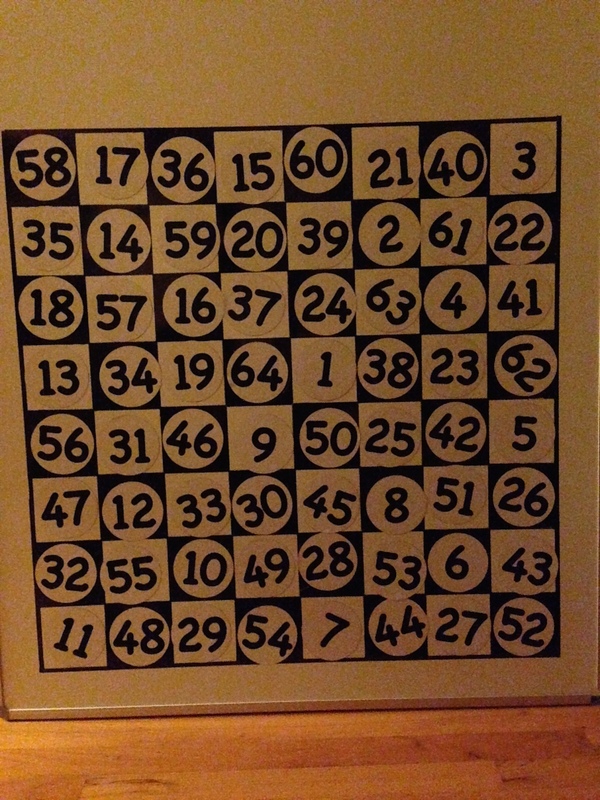 And now the probability of choosing the same squares, with either as the starting square, is about 2 in 125. And that makes the probability of this scenario about 1 in 31,250. But I think it is worth noting that the probability of those two squares being chosen at any given performance is independent of the outcome of other performances. It ranges from 1 in 1,000 to 2 in 125, which isn’t exactly “crazy”. But if it keeps happening, I’m going to think seriously about setting up a betting pool. April is sports month at The Odds Must Be Crazy. In this entry, hockey pro Steve Sullivan gets heckled by a fan after an injury. A few minutes later, same fan gets smacked in the face with a hockey puck. Leave it to our good friend George Hrab to send us a music-related coincidence, and one of the nicest ones you’ll ever see. I can only imagine both people were just as thrilled by the moment, but for entirely different reasons. What are the odds that the incomparable James Randi would upload a video to YouTube about a crazy coincidence? Well, considering the source, I imagine quite high. Regardless, this is fun, so we just had to share it with you. Our good friend John Rael just made this great video detailing something wild that just occurred to him. Instead of me describing it here, I’ll let you watch the video for yourself, as it’s far more entertaining. Thanks for putting in that time, John! We appreciate the thoughts and support. When one tracks enough of the details you can figure out that with two right-handed batters in a row, the odds weren’t too extreme that they’d both hit the ball into roughly the same left-field area. So since they DID manage to hit two home-runs in a row (unsure how often this happens… anyone? ), that would probably make it unusual if they DIDN’T end up within a similar range. But it’s still some pretty solid dedication on the part of the fan, plus some notable dexterity to pull this off while clutching the first ball in his hand, to catch both. btw, this was the first batter’s first career homer, and the fan was nice enough to offer him the ball after the game. He also gave the second ball to his buddy who provided the tickets and talked him into attending. Sounds like a pretty nice guy had a heck of a day to me. This sketch actually touches perfectly on what we run into when we look at a fun set of coincidences, or synchronicity, and start overanalyzing it. How far do you have to stretch to find the similarities, and at what point do you cut them off? One of the characters is straight, one gay, and something tells me Julian is ambidextrous*, so for the characters that seemed like a natural point to draw the line. But they could have drawn it sooner if they wanted to be much more technical. I mean, sure, they all had iPhones, but were they all iPhone 4s? Julia’s appeared to be white on the back, and as any self-respecting geek knows, the iPhone 4 wasn’t released in white until this year, branding Julia as a witch who must be burned at the stake an outlier from the pattern they were searching for much earlier than the moment their love lives came into play. Simply enough, craziness like this happens all the time when we’re looking for it, and is easy to tear apart when we want to. The real trick is in finding the fun in it no matter what, and not letting it color your view of the world or the people around you. You see it when people who have the same religion analyze their same book differently, or two members of the same political party can ascribe to completely different ideals. In the real world these tiny lines drawn in the sand over what point we consider incredibly similar people to be outsiders can lead to massive issues. But personally, I’m going to stick to my world, where these lines lead to sketch comedy, laughs, and racial stereotyping that’s funny because we’re not racist. We swear. *Yes, that was a joke. Obviously I meant bilateral. Julia hits the nail on the head about what we do here. It doesn’t matter why coincidences happen, only that they do, and they’re frakkin’ cool when they do. And they’re even more fun when you remember to submit them to us! Hint, hint. Hint.